International expert working group develop first pre-guidelines for conducting robust studies aimed at prevention of osteoarthritis (OA) after acute knee injury. 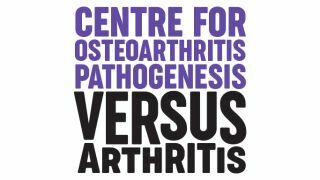 The Centre for Osteoarthritis Pathogenesis Versus Arthritis aims to develop new treatments for this disabling condition, improving healthcare and transforming people's lives. Our strategy is to turn our research findings into patient benefit. This includes finding targets for new treatments, new tests or markers, and personalised approaches to symptom management for osteoarthritis. Directed by Professor Tonia Vincent within the Kennedy Institute of Rheumatology, the OA Centre is hosted by the Nuffield Department of Orthopaedics, Rheumatology and Musculoskeletal Sciences (NDORMS), University of Oxford. We bring together researchers and clinicians from across the University of Oxford including the Kennedy Institute of Rheumatology, the Botnar Research Centre, and the Nuffield Orthopaedic Centre, as well as Queen Mary University of London, King's College London and MRC Mutagenesis Unit, Harwell. In addition to developing novel disease "markers" and therapies for patients with osteoarthritis, we are also creating a national training resource for scientists and clinicians working within the OA field. The Centre was created in April 2013 with substantial funding from Versus Arthritis, the University of Oxford and the Kennedy Trust for Rheumatology Research (KTRR). A further five years funding was awarded in 2018. Connective tissue growth factor contributes to joint homeostasis and osteoarthritis severity by controlling the matrix sequestration and activation of latent TGFβ. Cilia protein IFT88 regulates extracellular protease activity by optimizing LRP-1-mediated endocytosis. What are we doing to help treat OA? What can I do to help my OA now?